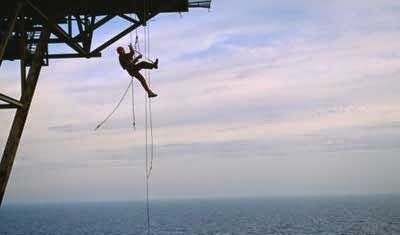 Every applicant for a oil rig worker to this kind of job wonders how it must be like to live in such environment. Certainly, the extreme isolation of so peculiar a place, the presence of such hostile surroundings as it is the open ocean and the cold or very hot weather conditions leave nobody impassive. Offshore oil rigs and oil rig jobs. Offshore oil rigs and oil rig jobs - It must be considered that conditions vary according to the different posts. Drilling, metallurgical or construction employees and their respective assistants work outdoors in hash conditions; geologists and engineers divide their tasks between offices, inside the oil rig platform, and deck areas, outside, enjoying an intermediate conditions; and managers, executive and administrative oil rig staff work in the offices, in the most comfortable situation. Nevertheless, living conditions on oil rigs have improved considerably and, nowadays, many offshore installations meet hotel standards Offshore oil rigs and oil rig jobs. Economically, working aboard an oil rig or platform is quite profitable. Certainly, income and benefits in this sort of oil rig jobs are considerably higher than any similar land-based positions. Additionally, all the possible expenses on oil rigs, such as food, accommodation and travel when going to and leaving from the workplace, are paid for by company, which means that you can bank everything. And it is this way even working aboard a local platform. Although, working in a foreign country as a oil rig worker is financially more attractive. Most of the oil and gas companies are based on places as Venezuela, Brazil, Middle East, North Sea or Scandinavian coast. This means that the oil rig workers have to fly long distances to reach their respective workplaces or to meet family and friends. All this is at the company´s expense. Schedules and shifts are another important subject. They vary, depending on the company and the type of position. A very common type of schedule consists in 14 days on, followed by 21 days off; another systems are based on working for 1 or 2 weeks, rotating off the platform for the same period; or 1 month on and 1 month off; and, sometimes, due to the speciality of the service, you will have to work until the job is finished. Hourly timetables vary from 80 to 100 hours per week, which might seem like a very long and tiring working week. But, it must be considered that the employees are in the workplace 24 hours a day, which avoids the problems inherent in land-based jobs, such as getting up hurriedly to drive to the job site, having meals or snacks hastily, etc. On the other hand, time off is one of the attractive side of this sort of posts. 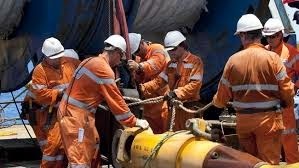 Few positions of oil rig jobs offer the workers so much time to carry out their private and familiar activities or to dedicate to another job or business. Offshore oil rigs and oil rig jobs. While on board on oil rigs, you may spend your time off in a wide variety of amenities and amusements, because modern offshore installations offer an interesting range of leisure activities, designed to ensure a comfortable rest. There are modern satellite TV and phones, updated selection of videos, gym, sauna, video games, connection to Internet, etc. Finally, the best oil rig companies offer special services to their employees at little cost or for free. Therefore, some companies provide excellent medical insurance, life and disability insurance, sick leave and, in some certain cases, profit sharing by taking a percentage of your wage and putting it in a profitable savings account. Few employments offer so interest conditions - offshore oil rig jobs.